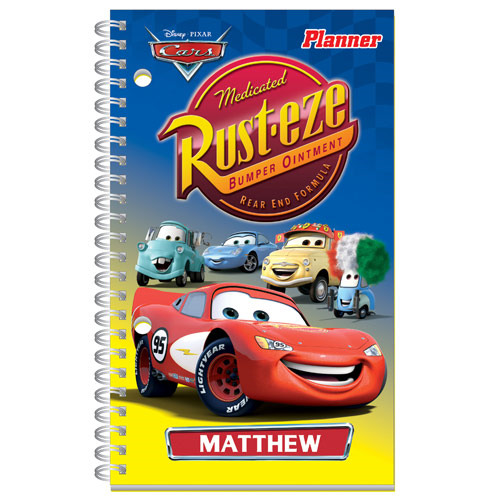 Let Disney and Pixar help you plan your day with this Cars Planner! Featuring an images of Lightning McQueen, Mater, Sally Carrera, and more, along with their sponsor "Rust-eze: Bumper Ointment." This planner measures 8 1/2-inches tall x 5 1/2-inches wide. Show off your love for the Disney-Pixar movie Cars and order today! Comes with a 60-week weekly schedule, 4-semester class schedule, alphabet stickers, and 40 stickers of events (i.e. birthday, field trip, holiday, test, event, and characters). The alphabet stickers all come with at least double letters, but some come with 3 or 4 of the same letter.